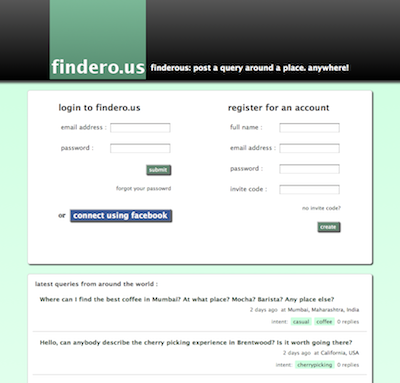 Finderous is a location based short Query/Reply website about a place. A user can post anonymous/non-anonymous queries/replies, chose to follow a place of interest or queries and post replies to queries. People follow only the content and not other people. Short and quick social collaboration tool. Simple, user friendly, clean interface.